When I first started making guitars, Guitarmaking: Tradition and Technology, by Cumpiano and Natelson, was my best guide. 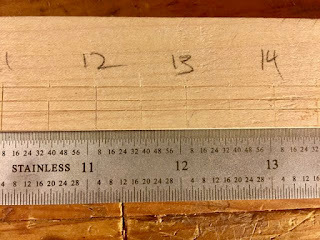 One problem I ran into with this book is that the authors recommend using a machinist's ruler graduated in tenths of an inch to use in making a guitar. At the time, I had a hard time finding an affordable machinist's ruler that was longer than 24 inches, I ended up buying a double sided ruler, both imperial and metric, from Bridge City Tools. 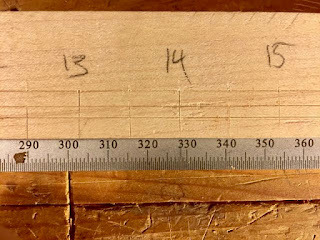 As I did more research into classical guitar construction I discovered most of the books available worked with the metric system and used it to take measurements of historic guitars. I never really gave much thought to either system, both accomplish the same task, namely measurement. Recently, I re-read an article on the restoration of an 1863 Antonio de Torres guitar by the luthier R.E. Brune. (Click here to read the article). In the article, after describing the guitar, Mr. Brune states "Aside from the lack of fan struts, there are several other notable features. The first is its adherence to English measurements based on the inch." 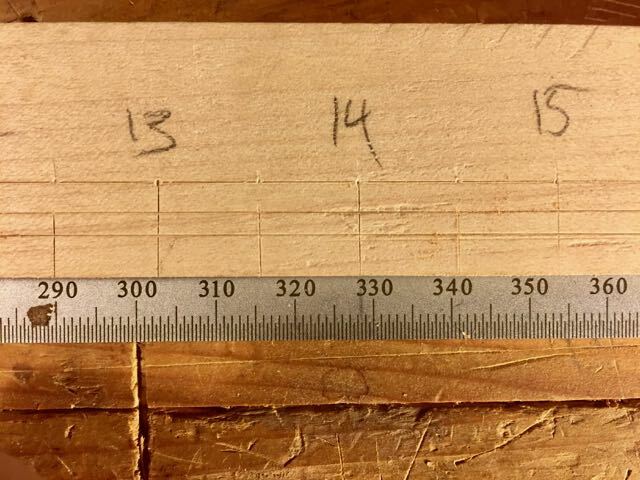 Wow, a Spanish carpenter using the English Imperial system of measurement! Torres worked as a guitar maker from about 1845 to his death in 1892. Of course, Mr. Brune doesn't address why Antonio de Torres used the English system. My first question was, why didn't Torres use the Spanish unit of measurement, that of the vara, pulgado and pie? These units of measurement are descendants of the Roman foot, very ancient, well used and loved by the Spanish. Yes, I know that the length of the vara was different in each Spanish town and province, but why would a man who apprenticed as a carpenter in his hometown take up a unit of measurement used by the English? The second question I asked was, maybe Torres did use the vara to layout his guitar plans and nobody used a vara to measure his guitars. I made a ruler based upon the Spanish vara to test this theory very unscientifically. As I understand it, the vara was/is equivalent to our "yard". Juan Villasana Haggard, who wrote Handbook For Translators of Spanish Historical Documents, states that the official historical vara was 32.91 inches; a codo equals one half a vara, 16.5 inches; a pulgada, consisting of 12 lineas, equals 0.914 inches; a linea equals 1/432 of a vara, or 0.0769 inches; a dedo equals 1/48 of a vara, 0.6949 inches; there is more, but I think you get the idea. Another source states "(t)he standard vara was the vara of Castile, (about 0.8359 meter, subdivided into 3 pies or 4 palmos)". A palmos is 8.23 inches, a pie is 10.97 inches. I ripped and planed down a piece of maple, I sharpened the points on my old Lodi brand dividers, set to them to that space between 29/32 and 59/64 and went on a wild ride for 26 pulgadas. When I placed the new ruler next to my trusty old Bridge City ruler, imperial side, I saw no marks really lined up, no pattern emerged. 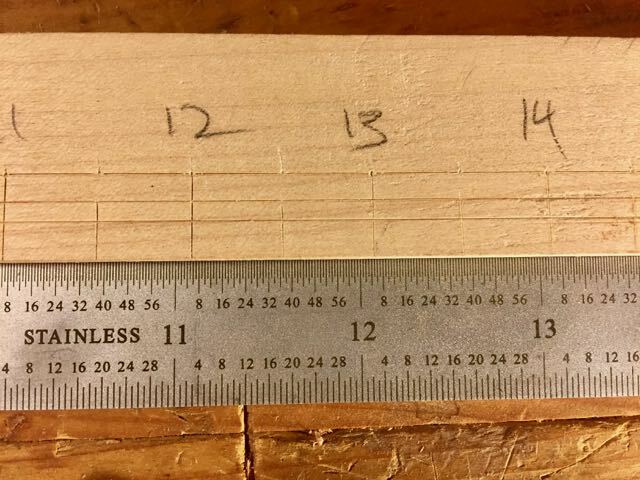 One half of the 25.625 inch scale length is 12.812 inches, and as you can see, the new ruler really doesn't line up with 12 and 13/16 inches. 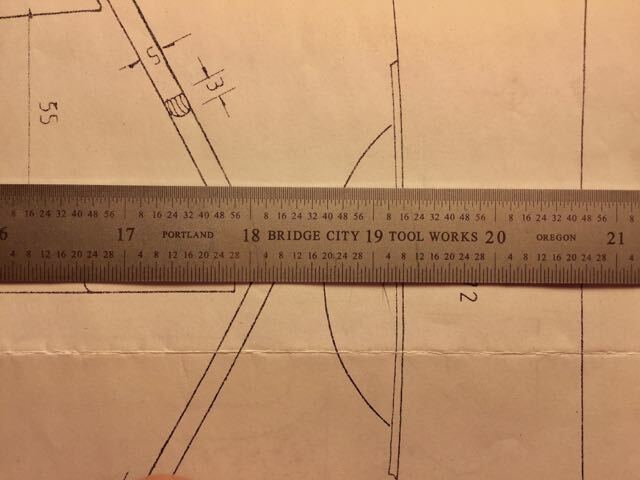 I flipped the Bridge City ruler over to the metric side and again, no alignment or pattern either. Half of 65cm is 32.5cm. Yes, I probably should have spent more time dividing the pulgadas into 6ths, 7ths, 8ths, 10ths, 12ths, 16ths, etc., but I need to buy better dividers and I am not sure I need to explore this side street further at this time. Third question: was there a connection between the violin and guitar makers of Seville, Spain and those of England? Last night, while surfing the Internet for "English unit of measurement and Spanish guitars", I stumbled onto a thread that was up on a well known classical guitar forum. I won't mention the forum's name, I find forums a waste of time, mostly because of the dilettantism you find in forums, but, I will say I think I actually found the start of answer to my first and third questions. A well known guitar maker mentioned that he had done some research on Spanish carpenters and guitar makers and learned that most of these men tried to purchase English made tools and rulers. Why English tools? They were the best tools available. The only problem with this maker's thread post is he does not cite his reference for this claim. This maker also states that he has examined guitars made by the great Jose Ramirez III in the 1960's that layout perfectly to the English inch. That statement correlates with a statement made by the late Eugene Clark, a wonderful guitar maker, who said that nearly all of the guitars made by the great Spanish makers that he had repaired, laid out to the English inch. What a thought, Spanish guitar makers used the English inch into the 1970's! And Spain officially adopted the metric system over one hundred years earlier! 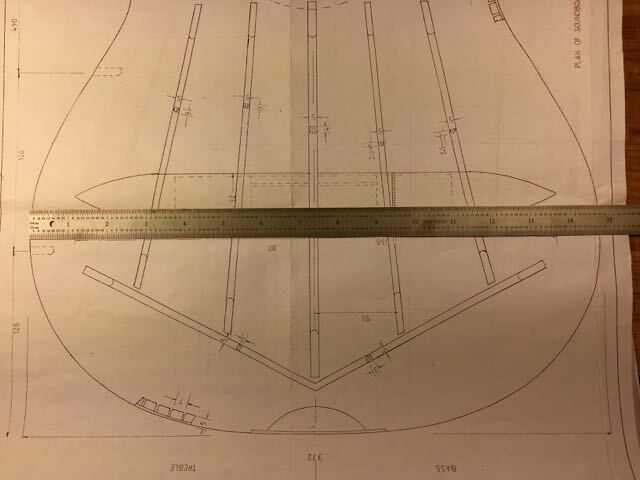 Here are some photos of a plan of a 1963 Hernandez y Aguado classical guitar from Roy Courtnall's collection purchased from LMI. All measurements on the plan are metric, but notice that the drawing lines up well with the English inch. Overall length of box, 19 1/4 inches. With of lower bout, 14 3/4 inches. I will look at the bibliography in Tools: Working Wood in 18th Century America, by Gaynor and Hagedorn, and The Tool Chest of Benjamin Seaton, by TATHS for paths to research British tool and ruler exports to Spain. At some point, I hope I can find books on the history of woodworking and carpentry in Spain. I also need to email that guitar maker about his references for Spanish carpenters and their English tools. If anyone has any suggestions for research possibilities, please let me know! I don't know how deep you want to go into this, but The Old Measure explores a lot of questions around different units (different feet) and different ways of dividing them. It won't answer the question of why Spaniards went English - maybe for the tools? - but it might help with the rest. Thanks, Simon! I will check out this book!